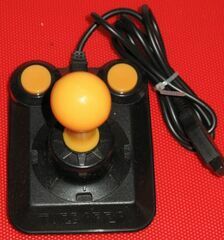 The Joystick Turbo Pro is a joystick made by Turbopro in 1987 which is compatible with the Sega Master System. This joystick was only released in Germany, and suffers from odd button placements like many other third-party joysticks of the day. The controller's shell appears to have space designed for turbo features, but this feature was scrapped after the Taiwanese manufacturer struggled to understand the circuitry behind it.